For those who enjoy entertaining, having a bar area for mixing and serving drinks is a welcome addition. 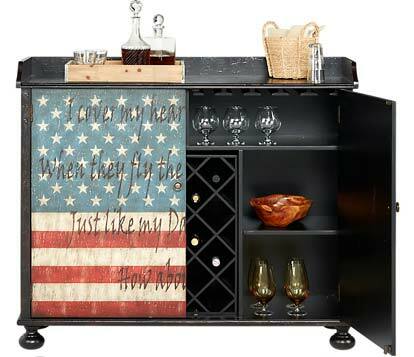 Not only perfect in a game room or a sheltered patio, there are lots of ways to incorporate a permanent or temporary stylish bar into your home. If you have the space for it, a built in bar is optimal. In addition to an expansive bar counter, it should include a sink, glass storage, cabinets for bottles, drawers for accessories and refrigeration for mixers. 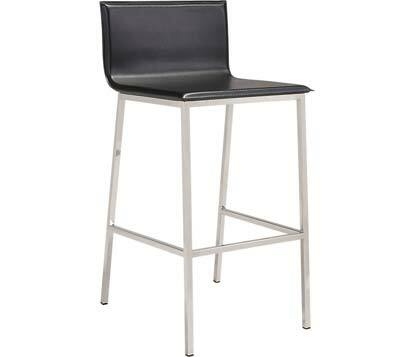 Add a few barstools and you have all of the components for many festive evenings to come. 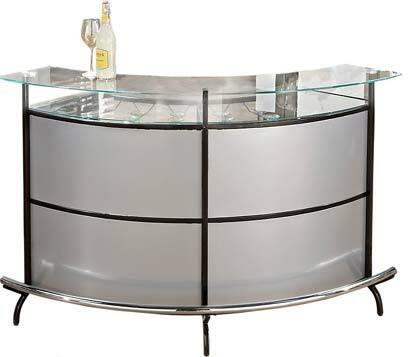 When there is no budget or room for a built-in bar, consider adding a free standing bar. 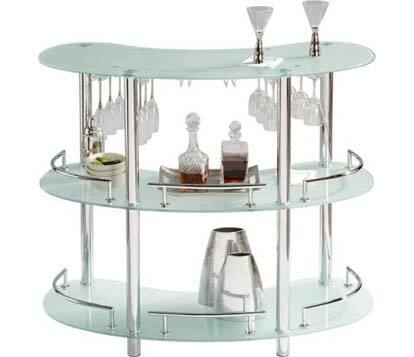 This type of bar occupies less floor space and still keeps all of your mixology supplies at your fingertips. Many models can be moved against the wall to take up less space when not in use and then pulled out for parties. 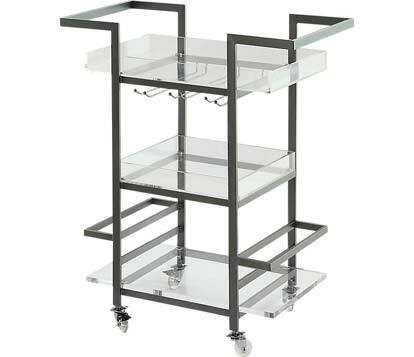 Bar carts offer a mobile solution for pared down drink service. 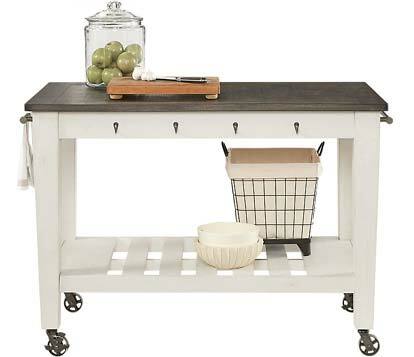 With some creative styling, a kitchen cart could be just as handy. Carts can be easily positioned wherever needed to help keep your guests hydrated. Even if you have a full sized bar in your home, these smaller-scaled pieces can come in handy to set up satellite bars in other rooms for large gatherings. 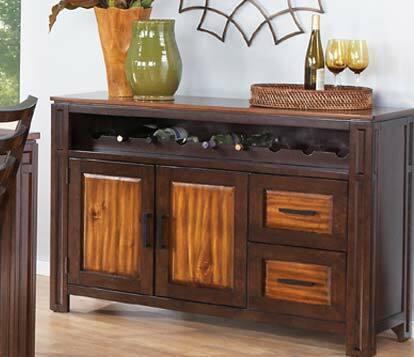 Sideboards and servers can do double duty when entertaining. 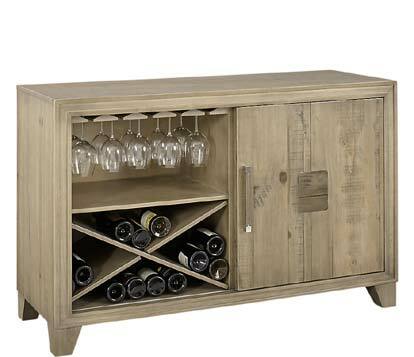 Whether in the corner of your dining room or along the edge of your kitchen many of these functional storage pieces have built in bar elements such as stemware racks and wine bottle storage. Set out a tray on top with mixers and glasses to create a do-it-yourself station. 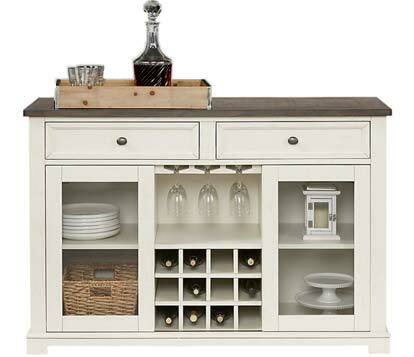 Accent cabinets come in all shapes and sizes, some are designed to open and become an instant bar. 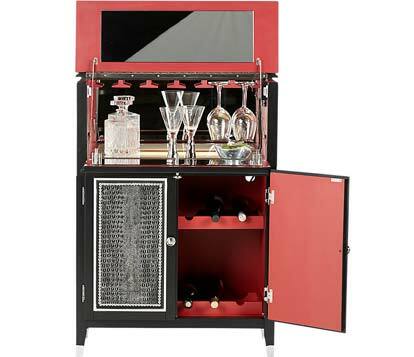 Whether for mixed drinks or wine tasting, a stylish accent cabinet will hide away the glasses and bottles when not in use and can simply be opened to share a bit of cheer as your guests arrive. Create a bar service area out of a shelf or two in your entertainment center or bookshelf– create a bar by setting aside a shelf or two in your bookshelf or entertainment center. 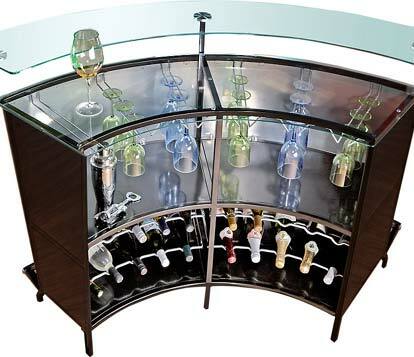 If your piece isn’t designed for it, you can install racks to hang stemware and to store wine bottles. 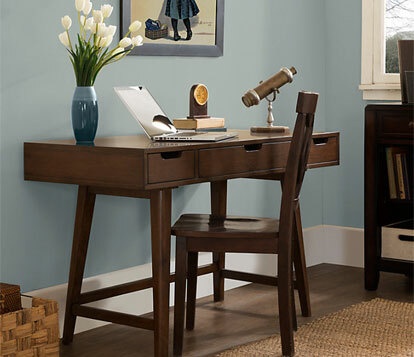 Put away the laptop and slide the office chair to the side and utilize a centrally located writing desk as a handy spot for a refreshment center. 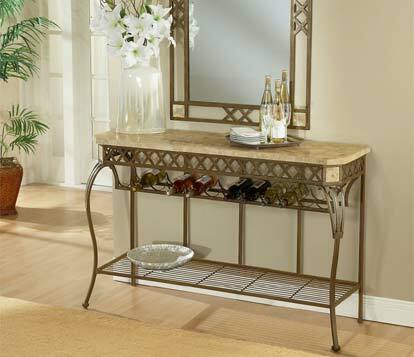 Greet your guests with libations at the door by setting up a drink station on your entryway console table. 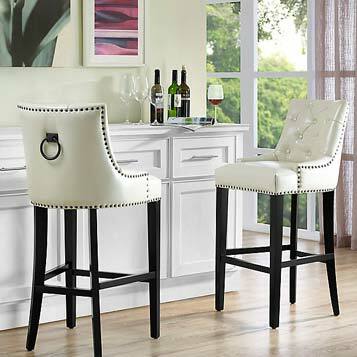 The style you choose for your bar should blend seamlessly with the rest of your home. Finding finishes that complement your existing furnishings can be fun. Remember that your bar area will be used for entertaining so a lively look is always welcome. 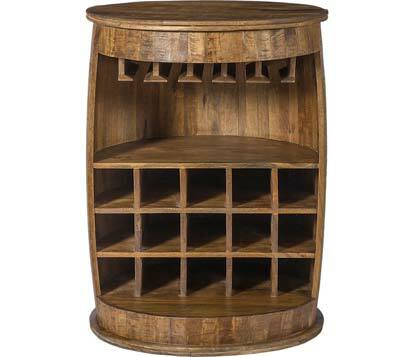 Rustic finishes offer a cozy and nostalgic feeling to a wine bar reminiscent of wine cellars and tasting rooms. 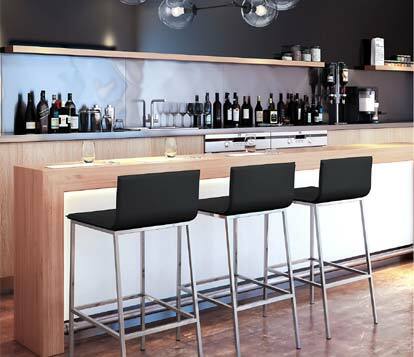 For a modern built in bar, look for contemporary bar stools with minimalist lines and sleek styling. 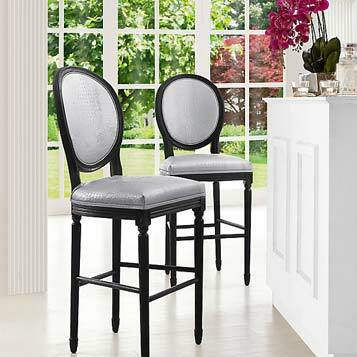 For a look that bridges classic detailing with contemporary lines, you can’t go wrong with transitional bar stools. 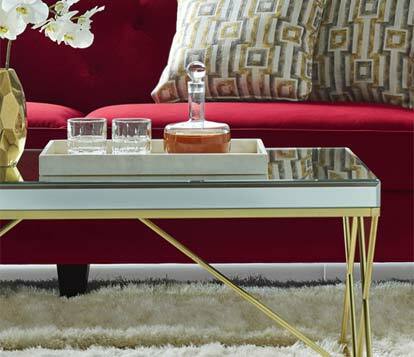 From modern free standing bar to an understated tray topped with a decanter and glasses for two atop the cocktail table, there is a chic way to outfit your home for any sized celebration.